ROBERT SAMUEL CHARGES $25 FOR THE FIRST HOUR AND $10 EVERY FOLLOWING HALF-HOUR. (NEWSER) – Robert Samuel is a professional time-killer. As the founder and CEO of Same Ole Line Dudes (or SOLD) in New York, he’ll keep your place in line to ensure you get your hands on “iPhones, the latest Air Jordans, or the hottest Broadway tix in town.” SOLD has even helped New Yorkers with brunch waitlists, sample sales, and passports. And because he’s paid for his time—$25 for the first hour, and $10 for every half-hour thereafter—long lines are likely a lot more welcome to him than they are to the rest of us. 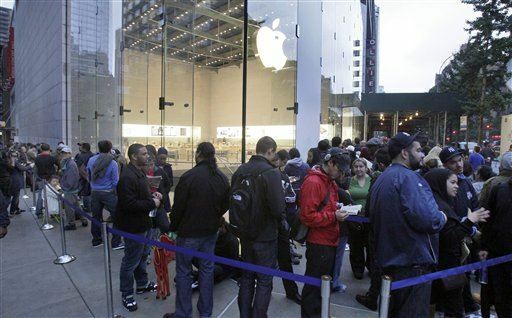 In fact, Samuel recently made nearly $1,000 when he spent 48 hours at the very head of the line for the iPhone 6, reports Salon, which calls the business part of the “Uber-ization of everything.” Since starting SOLD after getting laid off in 2012, Samuel now has 15 employees.